Friends, this wrap is everything. I don’t know about you, but I’m sick of canned tuna. For one, most canned tuna isn’t sustainable, and though there are sustainable options available, they’re priced to deter people from buying them. Secondly, tuna gets real boring real fast. Unless you drop a generous amount of mayo into your tuna salad — which kind of defeats the purpose of eating tuna for its health benefits — the stuff can often seem dry, tasteless, and downright hard to swallow. Instead, picture this: tender North Atlantic mackerel marinated in buttery olive oil with garlic, herbs de Provence, red bell pepper, and sliced olives. Dreamy, huh? That’s exactly what you get when you pull the foil back on King Oscar’s Royal Fillets of Mediterranean-Style Mackerel — and that’s exactly what you get in this crave-worthy wrap. Packed with a hearty lot of protein and a fair balance of carbs, this wholesome lunch option brings King Oscar’s tender and tasty Mediterranean-Style Mackerel Fillets to your plate with crisp veggies and a cooling mint yogurt sauce which, if needed, can be swapped for hummus or tzatziki. You do you. As if all of that wasn’t enticing enough, King Oscar is big on sustainability and the health of our oceans! Their North Atlantic mackerel is considered a lower food chain forage species and doesn’t pose the same concerns as larger predatory Spanish and King mackerel varieties. Additionally, because mackerel reproduce and mature expeditiously, the species is resilient to fishing pressures and fishing methods (mostly purse seines) resulting in lower by-catch and environmental impact. 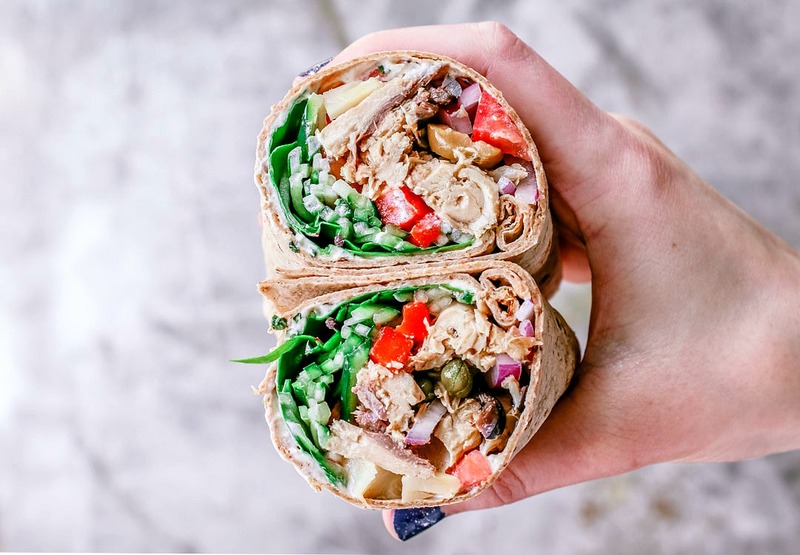 This wrap is lunch done right. Whether you’re brown-baggin’ it to work, in search of a convenient handheld eat n’ run option, or are in pursuit of a replenishing post-run meal, this wrap has you covered. I’m not a competitive runner by any means; I like to run three to four 5Ks a week because it makes me feel strong, healthy, and it keeps my anxiety at bay. With that said, the 4:1 carb to protein ratio isn’t necessary in my case. (That’s for those warriors running for over 60 minutes. I bow to them — I’m not worthy!) When running for less than 60, a post-run meal should simply be focused on eating something that contains both carbs and proteins; something that will fill you up and make you feel good without weighing you down. This wrap has been my go-to since the first day I threw it together and it. is. perfection. But you can enjoy King Oscar’s mackerel fillets no matter how you serve’em — whether they be tossed into a crisp salad, stuffed into a sandwich, plopped onto a cracker, or curled up into a wholesome wrap. Real talk: I’m guilty of eating some of it right out of the can. Mackerel has marvelous health benefits, too! Oily fish like salmon, sardines, and mackerel are fab sources of protein, Vitamin D, some B Vitamins, and selenium. They’re a rich source of omega-3 fatty acids, which can do wonders for your skin (who doesn’t love a healthy glow? ), and they’re believed to help against cardiovascular diseases. And finally, unlike tuna, you don’t have to worry about mercury content. The highest of fives to that, I say! Not sure if King Oscar products are available near you? Find out here! This Mediterranean Mackerel Protein Wrap is filled with tender fillets of mackerel, crisp veggies, and a cooling smear of homespun mint yogurt sauce. 1-2 TBSP Mint Yogurt Sauce (Recipe below) You can also use hummus or tzatziki! 1 handful of your fave greens I like to use baby spinach or swiss chard out of my garden! 1 TBSP chopped kalamata olives (optional) King Oscar's Mediterranean-Style Mackerel has olives in the can with it, but sometimes I like to add extra. Lay the wrap out flat and slather the mint yogurt sauce not in the middle, but closer to one side, leaving a 1-inch border between the spread and the edge of the wrap. Lay down your greens, cucumbers, tomatoes, artichokes, chopped olives, and capers. Then, carefully transfer that tender mackerel over to the wrap and lay it over the other good stuff. (I fit as much of the mackerel as seems reasonable and just eat the rest out of the can. Seriously. SO GOOD.) Finally, top the mackerel with the red onion. Fold in the two sides of the tortilla, and roll up like a burrito. This may seem slightly awkward the first time, but once you do this a few times, you'll become a wrap-rollin' pro. Put yogurt, mint, garlic, lemon juice, cumin, and cayenne in a small bowl and whisk together until well blended. Hit it with some salt and pepper to taste. Let the mixture sit at room temp, covered, for 30 minutes. Serve, or transfer to an airtight container and keep in the fridge for up to a week. *This hummus recipe* also works for a fabulous spread in place of the yogurt sauce! *Homemade Yogurt Sauce from Serious Eats. I'm so intrigued by these King Oscar's Mackerel Mediterranean-Style Royal Fillets! Canned tuna is something we keep in the pantry, basically for emergencies (throw it on top of a clean-out-the-fridge-style salad, etc). But you're totally right -- it's dry and uninspired. These little cans seem like the perfect thing to keep on hand and I love that they're sustainable! Where to do typically purchase them, Dana? Also, LOVING this gifs! Wow! Looks delicious! We used to eat a lot of tuna, but as you said it is not really sustainable and it does get boring really quick! I like that the mackrel here comes pre marinated and not just packed and salty water! Hey, Markus! I agree. Unless the tuna is ahi, yellowfin, sustainable, and seared rare, hard pass. Haha. I guess I'm officially a tuna snob! :o But yeah. King Oscar's products are marinated with such quality ingredients, and it's evident right upon opening the tin. I've actually never been very fond of canned tuna. As you say, there are a lot of problems with sustainability, but I generally just find it to be a kind of dull food for the most part. I definitely prefer fresh (and sustainable) tuna, but even then I tend to have that as a treat. But I'm really into trying to increase my consumption of the oilier round fish like mackerel and herring. I think because they're a little tougher to work with from a flavour perspective (canned tuna being so mild in comparison) they put people off... all the more reason to have an incredible go-to recipe like this one! I tend to buy unseasoned fish but the flavours in that can of mackerel (not to mention what you've done with them) sound realllllly good. Nice work! Thanks, Sean! I seriously never even look twice at canned tuna anymore. But I don't think people realize just how dull it is until you try something like this mackerel, or sardines marinated in infused oils. Now THAT is flavor. I think you'd love this wrap and quite honestly, I think you'd love the King Oscar products in general. You can both see *and* taste the quality, and they don't charge an arm and a leg for it like sustainable tuna which, really, still tastes mediocre. I seriously looooooove mackerel. It's such an underappreciated fish, mostly because I think a lot of people have had bad experiences with canned sardines. I don't think I've run into King Oscar before, but now I'm going to be on a mission, because hot damn... those look good! I bet I'd be more than happy just eating the mackerel straight up with a cracker, but I love how you've gone to the next level with these beautiful fresh wraps. Yum. It *IS* under-appreciated! And it drives me bonkers. I definitely think canned fish other than tuna, sardines specifically, have a bad rap. It's obviously due to some stank fish that some careless company threw together in a can at a cheap price and made grand circulation. King Oscar is wayyyy different. I mean, put it this way: their canned fish is HAND-packed. And guh. So tender and flavorful and amazing. I was too skeptical to try them out for a long time, and finally I just went for it and luckily it was King Oscar brand. I fell in love; I was left to wonder why the hell I opted for tuna for so long. And then I got in contact with His Majesty for partnering up, because I was head over heels. haha. My husband LOVES mackerel and I'm sure he'd flip if I made him these wraps! What a unique way to use fish, I love it. And do I even need to mention HOW gorgeous they look? Oh my!! I may just have to try these and will look for King Oscar's brand! I so agree on finding alternatives to tuna, mostly because of its unsustainability and then, because of its lacking flavor. Mackerel is so popular in Italy and the Mediterranean, my parents love it and use it often, fresh or canned. It is so good for you! This wrap takes it to a whole new level, though, beautiful and with amazing flavors. P.s. Those animated gifs...so fun! I've never tried canned mackerel fillets. This sounds like a very tasty alternative to tuna. I don't think it's possible to go back to tuna after I've had this particular mackerel. Gorgeous photos, I love mackerel but never thought of using it in this way I can't wait to try it! Thanks, Emily! Definitely let me know if you try this. What a glorious wrap! Your photos are amazing -- and I love that GIF. I love all kinds of fish, but I've never tried canned mackerel before. I'll have to look for it. Thanks so much! I hope you do find this canned mackerel. It's delicious beyond words. Let me know if you try it — I want to hear your excitement! It is so great to wraps in your arsenal for an easy lunch or to-go meal. You got that right, Ginny! Mackerel is such an under appreciated fish, in general I think North Americans need to look beyond tuna in the canned fish category. This recipe looks great and you can't beat a wrap. I agree, it's seriously underrated for the healthy punch it packs — and it's delicious! One of my biggest goals while working with King Oscar is to steer North America away from canned tuna and opt for canned mackerel and sardines more often. Just last night I was reading about how mackerel is a great source of magnesium--something I'm low on sometimes. This wrap has my name on it! The health benefits of some of these small fish species really are incredible! And I love to vouch for them whenever I can, because since going pescetarian and consuming more fish, my B12 has been stable (I used to have to get shots), my once problematic complexion is clear with a healthy glow, and I just feel so. much. better. There are times, usually around the holidays, where I'll be a little "flexitarian" and eat other meats, but I always regret it. Lol.